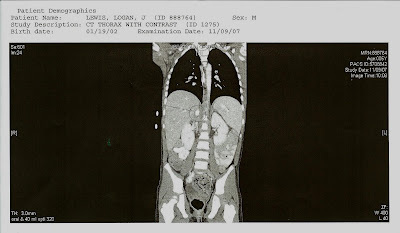 Tumor as of 11/9/2007 (circled w/ arrow pointing at it). It is a little smaller than a golf ball. Hi Logan! My mom and I are glad to hear that things are getting better! We will continue praying for you! We are so glad that yucky thing is almost gone. You are doing a great job. Everyone here is praying for you and loves you very much.